My teen ordered some PSP gear without permission. Let my loss can be your gain. condition. Comes with opened box, battery, and power charger. New in sealed box. Never used or opened. Email me if you’re interested in either of these items. Every once in a while I get a creative cooking itch that I just have to scratch. Recently those itches have involved rice and cheese. Tonight I wanted to explore what I could do to use up some eggs that had been in the fridge for a while. As I explored the cupboards I imagined an egg and rice hash that had a bit of kick to it. 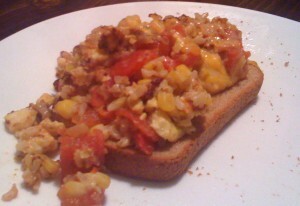 After exploring some recipes for ideas I began to create my new IlliMex Egg Hash. Blend the eggs, milk, and Worcestershire sauce in a small bowl. Then cook the egg mixture as scrambled eggs in a large skillet over medium heat. Add the cooked rice and a drained can of corn to the cooked egg mixture. Add black pepper to taste. Brown the hash mixture for about 10 minutes over high heat. Once the hash has slightly browned, mix in the salsa verde and diced tomatoes. Simmer for about 5 minutes over medium heat. 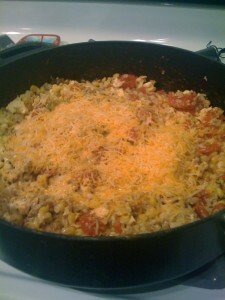 Top with shredded cheese and let sit for 10-15 minutes before serving. Try hash browns instead of rice. Use traditional salsa or picante instead of the salsa verde and diced tomatoes. Add some ham or sausage to the hash mixture. 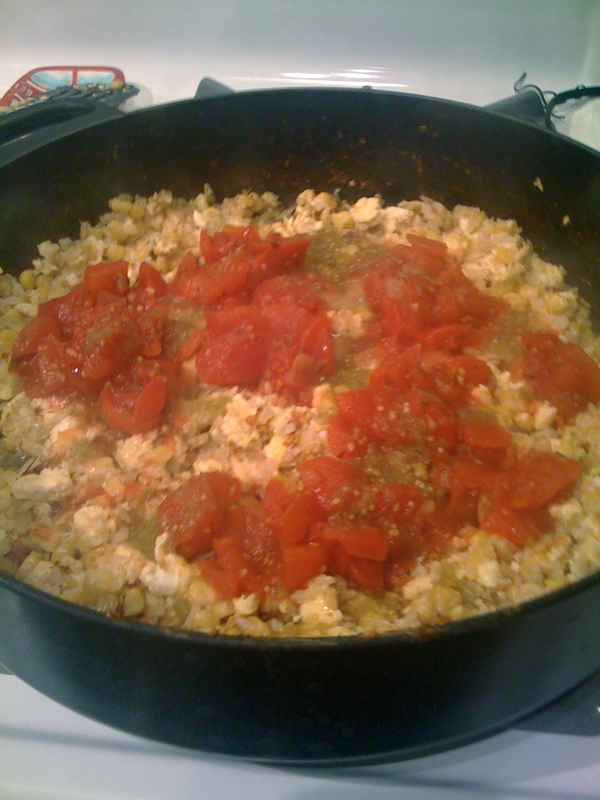 Add onions or green peppers to the hash. Add some Tabasco sauce for a bit more kick. Let me know if you try this off the cuff little hash recipe. Or shoot me ideas of ways to improve it. I’d love to hear your thoughts. Wow, originally uploaded by bill_glick. 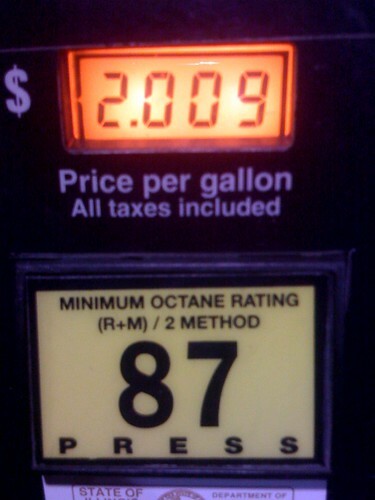 2.009 is even lower than I predicted a month ago. I like it. We finally received our first of the new MacBooks at work today. We’re considering making this our default, preferred laptop across the organization. So, I gave it a quick trial run for about 45 minutes. First, how does this keyboard feel? I think it’s a tad bit cramped. The response of the keys is ok, but I feel like my pinkies are held in uncomfortably tight. The screen seems fine to me. Less real estate than I’m used to, but much easier to read than my 17″ high res screen. The speaker response is very adequate. A bit tinny, but fine for normal work use. The track pad seems pretty natural – I forget I don’t have a button. Sitting it on my lap, it feels too small for me. But, I could get used to it. The compact size and light weight make it nice for moving around the building easily. The glossy screen is very nice when the display is set to bright. But, if I’m trying to save power in a meeting by dimming the screen, the glare makes it hard to view. But, again, I’d get used to it. I plugged in the laptop to a projector in a conference room, and it worked exactly as my MBP does as far as connectivity. Looked fine. The entire machine just feels well made. While the keys look cheap, they work well. The screen is amazing and very rugged. All the metal and glass on the case feel awesome to the touch and yet extremely rugged. The only problem I had with the MacBook is that my wireless internet seemed to be really slow. I’m not sure if that’s an issue of the MacBook or if we were having problems here at the office today. Overall, I think it’s a great little laptop for typical users at our office. Some developers will still prefer the 17″ MBP, but it’s adequate for the majority of our Mac users.